The next Arianespace Vega mission from French Guiana has been authorized for liftoff tomorrow following completion of its launch readiness review, which was conducted today at the Spaceport. This assessment is held prior to each flight of an Arianespace launcher family member. It confirmed that the lightweight launch vehicle and passenger – the MOHAMMED VI ‐ B satellite – are flight-ready, along with the Spaceport’s infrastructure and the network of downrange tracking stations. The mission is designated VV13 in Arianespace’s numbering system, and it will be performed from the Spaceport’s SLV launch site – where the Vega was assembled and now stands in a flight-ready configuration, protected by a mobile gantry that will be withdrawn prior to liftoff. All is now set for tomorrow’s liftoff at precisely 10:42:31 p.m. local time in French Guiana (1:42:31 UTC on November 21) for a mission lasting 55 minutes and 57 seconds. Produced by Thales Alenia Space as system prime contractor and Airbus as co-prime, the MOHAMMED VI ‐ B satellite has an estimated liftoff mass of 1,108 kg. and will be deployed into a Sun-synchronous orbit. Once in orbit, it will be used primarily for mapping and land surveying activities, regional development, agricultural monitoring, the prevention and management of natural disasters, monitoring changes in the environment and desertification, as well as border and coastal surveillance. 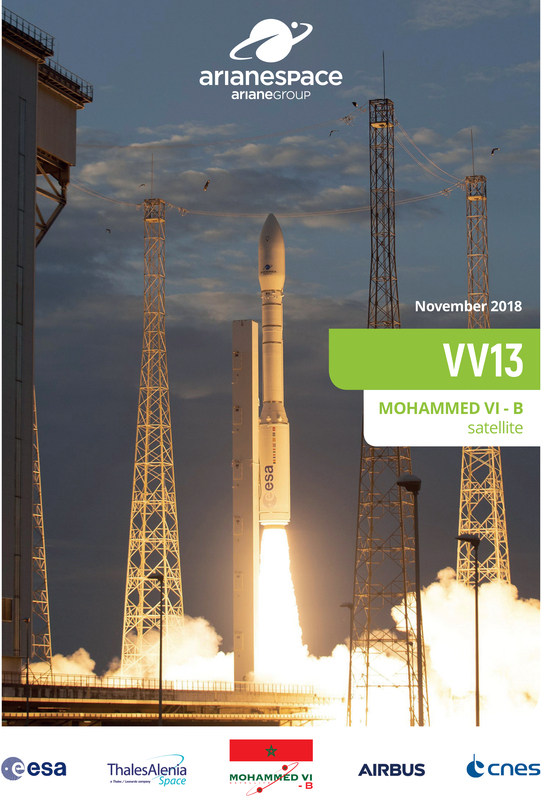 It is the second satellite for the Kingdom of Morocco’s MOHAMMED VI ‐ A & B program, following Arianespace’s Vega launch of the MOHAMMED VI ‐ A satellite in November 2017. Designed to be complementary, the two spacecraft will work together to enable faster coverage of zones of interests. Flight VV13 will be Arianespace’s ninth mission in 2018, and is the company’s second this year using a Vega launcher – which is one of three launch vehicles operated by Arianespace at the Spaceport, along with the medium-lift Soyuz and heavyweight Ariane 5. Vega is provided to Arianespace by Italy’s Avio, which is the industrial prime contractor.